The food production manufacturer previously used hydraulic motors to drive the conveyor system. However, the open environment of the application presented several mechanical issues for the motors. A large food producer company prepares an enormous amount of corn every year for frozen foods. During this production process, the kernels are removed via a conveyor system that drives the corn cobs through, de-kernels them and moves them further down the line. The food production manufacturer previously used hydraulic motors to drive the conveyor system. However, the open environment of the application presented several mechanical issues for the motors. Fluctuating temperatures throughout the course of the corn season caused changes in the viscosity levels of the hydraulic fluid, impacting the speed of the motors and making the conveyors vary in performance. Bison came in to offer an alternative solution to their current hydraulic motor provider that could withstand the four-season environment as well as provide speed control throughout the application to ensure reliable operation. After reviewing the application, Bison’s engineering team recommended their AC PowerSTAR Right-angle hypoid gearmotor with an inverter drive for enhanced speed control. The PowerSTAR’s housing is designed to thrive in indoor and outdoor environments. For this application, the Bison team recommended a completely sealed PowerSTAR for improved dust and particulate protection. The manufacturer installed the PowerSTAR on each one of their corn conveyors to drive the kernelling process. The speed was controlled and maintained through the inverter duty drive to ensure it stayed with an acceptable range. One year later, the PowerSTAR units are operating well (even after running continuously throughout an entire season). The manufacturer liked having the speed controlled through a single drive as well as having the drive and gearmotor provided from a single-source supplier. 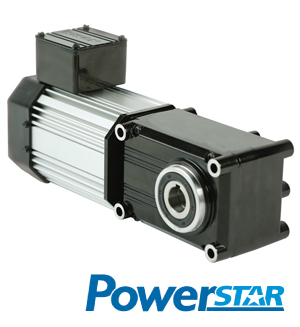 Going forward, they are looking at utilizing the PowerSTAR gearmotors in additional applications in the process. For more information on PowerSTAR Right-angle hypoid gearmotors, please visit us at www.bisongear.com, or contact us directly today and ask to speak with an inside sales specialist. Download PowerSTAR AC brochure here.